Preheat the oven to 200°C/400°F. Have ready two 200ml capacity ovenproof ramekins or cups. In a small bowl, mix the blueberries, lemon zest, sugar and corn starch. Divide equally between the ramekins. In a medium bowl, place flour and butter and, using your fingertips, rub the ingredients together until mixture resembles breadcrumbs. Add the almond meal and sugar and mix. 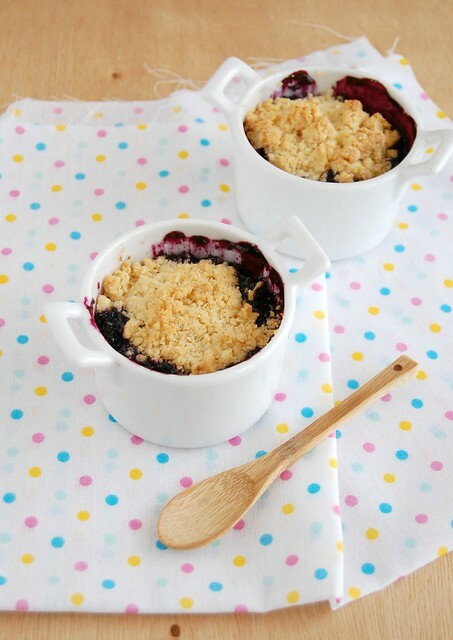 Sprinkle over the blueberries and bake for 30 minutes or until topping is golden and fruit is bubbling. I love crumbles with some icecream. One of my favourite desserts, no doubt. Apple crumble is my fave, but I've never turned down a bite of any kind! Well, I couldn't agree more...crumbles are divine, any time of year. And, so great that you can use frozen fruit too. What's not to love????? Great post, as usual! I ADORE NIGEL SLATER!!! (and your blog which I just recently discovered!) This looks wonderful, I love the way it uses almond meal in the crumble base. Can't wait to try!